Time heals a broken heart. But can a plate of pasta puttanesca? San Francisco chef Dante Palermo is on the broken heart diet: he’s lost the love of his life and twenty-five pounds. Can a visit from the ghost of his Sicilian nonna change all that? Not if Dante can’t master his melancholy. In the midst of his emotional free fall, Dante opens a restaurant in North Beach, San Francisco’s famed Italian neighborhood. As he clashes with his ill-tempered business partner, he begins a journey to career success beyond his imagination. With his heart, however, the struggles endure. On an enchanted odyssey that takes him from San Francisco to Des Moines to Rome, Dante tries to overcome his heartache and win the heart of his inamorata. 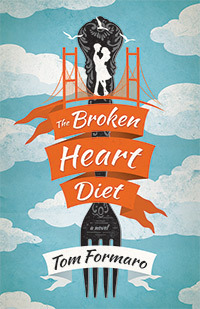 Full of magic, lighthearted fun, and romance, The Broken Heart Diet tells the story of one lovelorn man’s attempt to find true love.